The Chevalier Roze was the great secular hero of the Marseilles plague, more heavily represented in the iconography than any other figure (though his fame may be something of a 19th and 20th-century construction). Nicolas Roze is situated firmly within the merchant dynasties of Marseilles; like his father before him, he was baptised and buried in the Église Saint-Martin in Marseilles. But his story seems to belongs to the world of soldiers, adventurers and Barbary pirates rather than to that of international commerce. Roze's father, who held a naval contract for building and equipping small vessels, had created outposts in the major ports in Spain under the control of his sons, Claude in Barcelona and in 1695 Nicolas, the younger brother, in Alicante. The younger Roze soon found himself in the middle of the War of Spanish Succession; When Alicante was beseiged by Imperial forces in 1706, Roze raised two companies of soldiers and for a while personally held the castle against the beseigers. He returning to Marseilles in triumph, receiving a gratification of 10,000 livres and was accepted into the ancient chivalric order of Saint Lazare. Evidently he had acquired a taste for soldiering for he subsequently returned to Spain where he took part in the victorious battle of Almanza under the maréchal de Berwick and was present at the siege of Xativa. Back in commercial circles, he became involved in the Levant cloth trade and in 1717 was named French Consul for Modon (Methoni), the Venetian port in Southern Greece which had lately fallen to the Ottomon Empire. It was here that he encountered pestilence for the first time and organised sanitary measures. In 1720 a conflict over the repurchase of slaves forced his fateful return to Marseilles. The Chevalier Roze landed in Marseilles in May 1720. Legend has it that he found himself in quarantine with the crew of the Grand Saint-Antoine. As soon as the extent of the epidemic became apparent he offered his services to the échevins and was placed in charge of the Rive-Neuve, the rich commercial district separated from the old city by the port. Although prosperous, this was an area with a large unruly population of artisans and dockworkers. He was later also given responsibility for the poor district of Notre Dame de la Garde. He set about imposing stringent measures to clear the area and impose a quarantine. He was given permission to create two companies of thirty men, and to appoint officers under his command. He commandeered the immense rope works as a hospital, furnished with mattresses and straw, and subsequently improvised a second hospital in Rive-Neuve to admit 80 orphans whom he maintained at his own expense. Under his orders, five ditches were dug to bury the dead of the area which soon numbered three-and-a-half thousand. He personally visited the sick in close proximity, among them large numbers of sailors from the nearby docks. Those who remained in their houses were forced into the hospitals and their homes cleared and the contents destroyed.
. Roze also tacked the acute food shortages, personally presiding each morning over the distribution of bread to the poor and imposing fixed prices on the butchers, who were said to be profiting from the shortages. 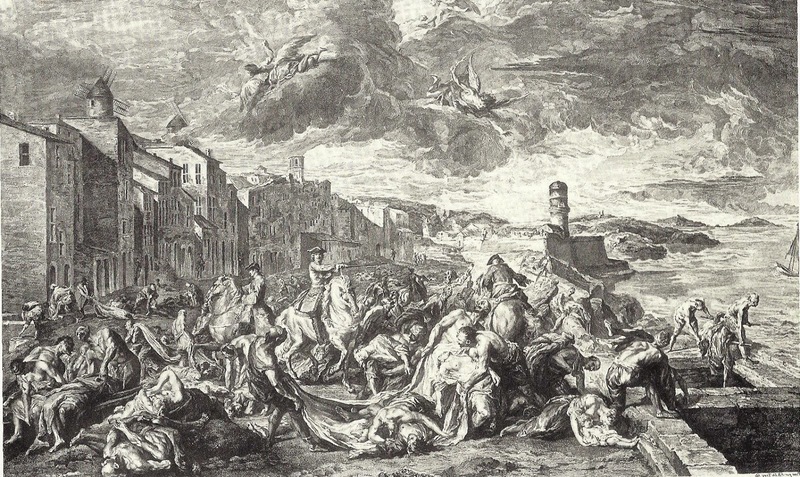 Thieves and looters were rounded up and summarily hanged. Every two or three days Roze reported to the Hôtel de Ville where he was the principal architect of the emergency measures for the city as a whole, even commandeered goat's milk for the orphaned new-borns - a considerable problem, for on 1st September volunteers are said to have gathered between 12 and 13 000 infants. The town was short of wheat and the ships were landing not at Estaque but at Frioul, where they found themselves short of ballast for the return journey. Roze forced fishermen to put to sea laden with sand and stones. Not only this, but, assisted by representatives of the fishermen themselves, he employed fishing vessels to trawl in the dead bodies floating in the port and tow them out to sea. The famous episode of the clearance of La Tourette took place on 16th September 1720. 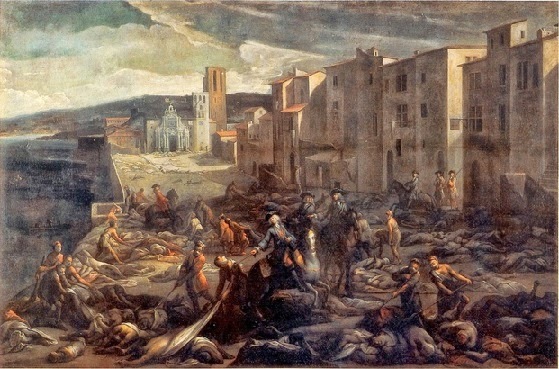 By August the mass of bodies in the streets had become the authorities' most pressing problem. The military commander, Langeron had communal graves dug and began the systematic removal of corpses using convict labour. At La Tourette, the hillside area overlooking the sea, a thousand bodies had been piled for three weeks in the heat of the sun and were now in a state of advanced decomposition. Merely to visit the site was an act of courage and Roze did not try to hide the dangers of the task. On the place de Linche he distributed wine to his men (who are described as "volunteers" rather than pressed convicts). He arrived on the scene first, dismounted, seized a cadaver by its leg and personally dragged it to the waiting ditch. Others followed his example, blocking their noses with vinegar soaked rags against the stench. Almost all fell ill, including Roze himself, though he subsequently recovered. In the 19th century Roze became a popular hero largely because the "episode at La Tourette" became a well-known set piece for artists, with versions by Paulin Guérin and François Gérard among others. The subject became widely known through an engraving of 1727 by Simon Thomassin, after a painting by Jean-François de Troy. The original painting, which now belongs to the Musée des Beaux-Arts in Marseilles, was originally commissioned by the Roze's brother Claude and was among the Chevalier's own possessions according to the inventory at the time of his death. A second contemporary picture, by Michel Serre, is now widely reproduced on the internet, but seems to have been only recently rediscovered in the Musée Atger in Montpellier. It was not until 1887 that a statue to the Chevalier was erected by public subscription in Marseilles - a project which, by all accounts, was subject to much difficulty and delay. Paul Gaffarel and Mis.de Duranty, La peste de 1720 à Marseille et en France, d'après des documents inédits (Paris 1911), p.98-107; 206-7.